I'm sure fans of Deanna Raybourn are excited to meet Veronica Speedwell, and I guarantee that y'all will fall in love with this new Victorian heroine just as much as I did, if not more. A CURIOUS BEGINNING is the first of the Veronica Speedwell Mysteries and we're treated to reading the story from Veronica's perspective. Just who is Veronica Speedwell? At the time of A CURIOUS BEGINNING, Veronica is 24 turning 25. She's an orphan, raised by two spinster sisters, and is named after a plant. She's also a lepedopterologist, a butterfly enthusiast and scientist for us laymen, and has been since she was 18, in an effort to travel the world and become an independent woman. Suffice to say Veronica is ahead of the curve in terms of feminism and all that. Reading A CURIOUS BEGINNING through Veronica's eyes is such a delight because the girl's whip smart, very observant, and extremely witty. I don't think Veronica knows what awkward means because she will drop the mic on you regardless if you're the vicar's wife or a member of the aristocracy. A shrinking violet, Veronical Speedwell isn't. A CURIOUS BEGINNING has a double sided mystery. Suddenly, Veronica's become a target, and the only person who could possibly know her real identity, a German Baron who's name is so long I did not care to memorize it, has been murdered days after he met Veronica and dropped her off the care of Mr. Stoker (not Bram). I love it when a story deals with layered puzzles that are interconnected. In this case, the Baron's murder is very damning to both Veronica and Stoker as either of them could easily be framed for it given their situation. It wasn't until the latter half of A CURIOUS BEGINNING that Veronica and Stoker started their own investigations, mainly to save their asses from being incarcerated. Like I said, it's all connected and it all boils down to Veronica's birth parents. Yeah, a little yucky, which made Stoker's eventual makeover awe inspiring. It's like watching an episode of Beauty and the Geek, and definitely not your over the counter bodice ripping hero. I still want to jump his bones though because I do love hot nerds! 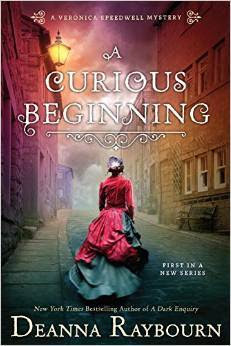 Overall, A CURIOUS BEGINNING is a solid series debut, and I have no doubts that fans of Lady Julia Grey will love Veronica Speedwell. It has all the marks of a great historical mystery, the dialogue is impeccable and immdediately transported me to England 1887 (or at least how I imagined that era to be), and the budding partnership/romance between Veronica and Stoker is the hook for me. A CURIOUS BEGINNING is another guaranteed bestseller and I'm hoping NAL/Penguin will ask Ms. Raybourn to write more books than the original three contracted. I skipped your review because I have to read this one but I'm soo late... I'll try to do that soon but I'm glad to see you had a good time. Oh lord, it's a surprise!! You have me *curious*, Braine. :) I'm thrilled that you found such an incredible HF read. And I'm adding it to my reading list now. Yay! We are review twins today! So glad you loved this too! Yes we are, great inds, Ali! I am a Deanna Raybourn fan and am very excited to meet Veronica. Thanks Braine for putting her front and center for me. Great review I love how you spelled it out for us. Weee! Then you shouldn't miss this, it's fantastic! Yup, Veronica is such an endearing heroine. whip smart! I added this one to my TBR a few weeks ago. I just knew that it is a great read and I love that cover. Glad you liked this one. Great review! Awesome! I hope you get to it soon! Can't wait! Love her books! 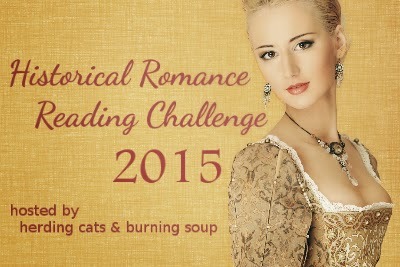 You won't be disappointed, it made me want to reread a Lady Julia novel immediately after. Thanks, Mel, keep it in mind if you're in the mood to read something different. Taxidermy is yuck, but the rest looks awfully good, I'd love to read it ! Hahaha, yeah, it's so very old world though. That cover is AWESOME! I love that the leading man is not some Alpha male but instead a little nerdy and in need of some help when it comes to hygiene and appearance. LoL Great review. Oh yeah, it's nice to have a beta hero once in a while. Okay I'm adding this to the wishlist RIGHT NOW! It sounds AMAZING! I've read one book by this author and it was excellent! She is a very clever lady. Very composed even on the most tense of situations. There is something about those feminists from the Victorian era that make them all the more fierce. Need this like, whoa. Exactly, because you know they're going against the grain and it's doing them more harm than good. God forbid your reputation be tarnished by modern views! Gasp! I've already decided to get this one b/c the heroine sounds fantastic!!! But wait, she's not who she is?!? No one mentioned that before! I can't wait!! Exciting review!! Yes ma'am. Prepared to be surprised! I'm so bummed I didn't see this one up for review. It's gorgeous and your review plus another I read earlier today make it sound so good! I was curious about this book because of its cover... Yes, I'm a cover whore... and now you review made me want to read it. I wantz!! Yes Beauty and the Geek..exactly..lol I am looking forward to continuing this one! I honestly dismissed Stoker when he was first introduced. He was so eccentric and more like a sidekick than the hero. Boy did he prove me wrong! Sounds like a good read Braine... The mystery element has me intrigued. If you want to switch it up, read this! Love this cover and it sounds like a great read! One of these days I will give this author a go!